ONEDock Duo is designed by Press Play to give your Apple Watch and iPhone a real sense of power, organization, and stability, yet look luxurious and compliment your Apple devices beautifully. 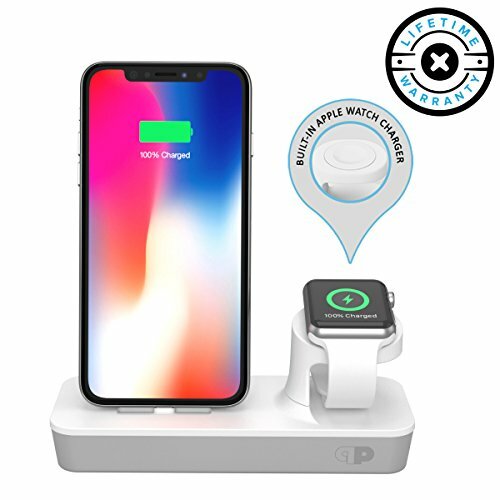 Original Apple Watch Charger – Built-in Apple Watch Magnetic Charging Cable/Puck and Lightning Connector for iPhone/iPod. Apple MFI Certified – Protects your Apple Watch & iPhone from battery damage, excessive heat, bad quality charge that drains in minutes, and annoying “error” messages. IQ Adapter – Optimizes power flow to maximize charge rate and improve your device's battery life. Also provides efficiency and power to charge your devices CLEAN and RAPIDLY. A Durable & Practical Solution – The weighted base and grip pad stabilize your dock and prevents accidental knockovers. LIFETIME WARRANTY: Press Play offers a LIFETIME manufacturer warranty that will protect you against all defects in material and craftsmanship. APPLE CERTIFICATION - Made for Apple Watch 38mm / 42mm, Series 1 / 2 / 3, iPhone X / 10 / 8 / 8 Plus / 7 / 7 Plus / 6s / 6s, and iPod Nano. Your devices deserve a quality charge that does not drain in minutes. HIGH GRADE ALUMINUM - Premium Quality Aluminum Stand with Rubberized Feel Luxuriously Holds Your Apple Watch and iPhone. A Durable & Practical Solution. The weighted base and grip pads Prevent dock from being accidentally knocked over. ONE Dock Duo is a Durable and Practical solution. SMART-IQ ADAPTER - Optimizes power flow to maximize charge rate and improve your device's battery life. Also provides efficiency and power to charge your devices CLEAN and RAPIDLY. Perfect for your Home or Office. ONE Dock Duo Apple Watch Stand comes in High Quality Retail Packaging to make it the perfect GIFT. PERFECT ANGLE - Adjustable Lightning port tilts back and forth for the perfect view. NOTE, not all cases are dock compatible such as Otterbox or Lifeproof brand cases. Frequent traveler? With its ease of portability, ONE Dock Duo is designed for ON-THE-GO as well.